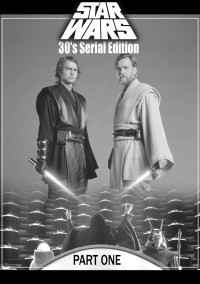 This is a black and white silent edition of the Star Wars Prequel Trilogy saga. 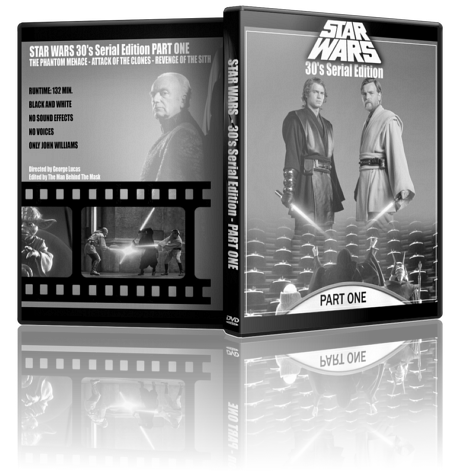 No voices, dialogue cards, no sound effects, only John Williams music. Ripplin for assistance on dialog cards. As others have commented, a really nice edit. All the more so as this negates half of Christensen's part - his voice. I watch a lot of serials, and this had the right feel to it. That said, the black and white version was too clean, and might have been better with more elements of distress. Dusty would have other problems. All in all, I enjoyed this a lot and would recommend it. Overall thoughts: Great concept but I didn’t like the clean look of them (I’m sure I’d enjoy the Dusty versions more). Editing was great, stories were streamlined well. Only major nitpick is I didn’t like the design and font/kerning for the dialog cards. Movie specific thoughts: Phantom Menace was still stupid and boring. Attack of the Clones was pretty damn good! ROTS was a little boring but good overall. Not going to say much, because a lot has been said previously, HOWEVER, I do have to say that this edit really is fantastic. I’ve only watched Episode 1 so far, but its fantastic. So much of the movie was taken out to make it a much faster paced, more enjoyable movie. Nothing worth keeping was left out, and everything in it is great. Awesome use of music. Everything was great. I’m looking forward to watching the rest of the movies like this!